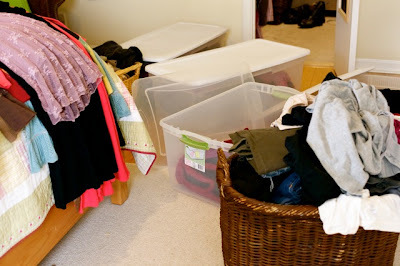 March "Reduce Clutter" Theme: Clothes! Maybe it’s the time of year, but it seems like many of us are in desperate need of clearing out our closets and dresser drawers. It seems like the perfect time to conquer our clothes! For all of you participating in Reduce Clutter; Create Space 2010, this will be our “loose” theme for March. 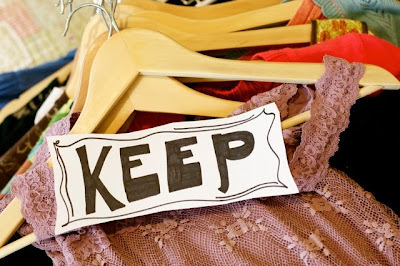 Feel free to clear clothes along with us, or if you are feeling inspired to reduce clutter in another part of your life, then definitely go for it! Share your journeys with us on the Reduce Clutter Forum. Then I made three piles: one to KEEP, one to DONATE, and one to REPURPOSE. If I hadn’t worn the item within the last two years, and if it didn’t make me smile or feel good when I looked at it, then it went straight to the donate pile. 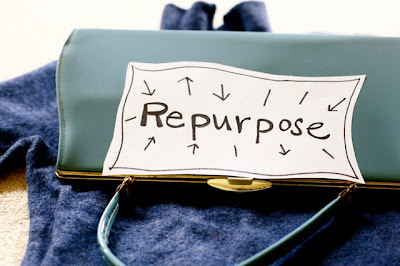 I kept my repurpose pile very small, with only two items, a wool sweater that shrunk, and a cool vintage purse that I want to embellish. That’s it, though. Only two. Because I’m trying to be very mindful not to reduce one pile, to then create a new pile somewhere else. I do not need several projects waiting for me. If I don’t get to these projects in three months time, then I’m moving them back to the donate pile. For those of you with little helpers, include them in your project. What a great lesson for them to learn, and I found my little guy to be a great sorter! I packed up my winter clothes (even though it’s only 26 degrees today – I’m sick of sweaters! ), and pulled out my spring cloths to be washed. My one small change goal for this month is to not buy any new clothes or shoes until I reduce the current cloths and shoes I have by half! I’m also going to get more creative with the cloths I do have, and will explore things like “clothes swaps” with my friends, creative recycling and sewing to make them fresh and new. 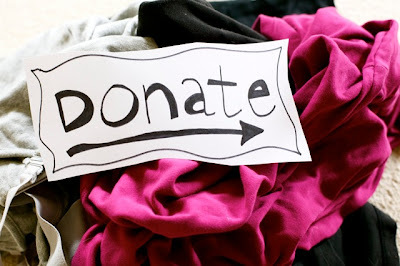 Please share any creative clothing recycling ideas you have! And remember, reducing clutter is hard work. You don’t have to do it alone! 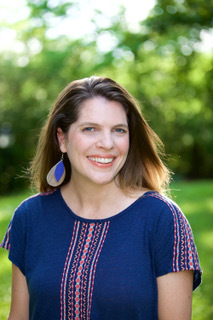 Join the other reduce clutter explorers so we can help each other along the way. Also, does anyone know of organizations that are collecting good t-shirts for Haiti, or others who are in need? 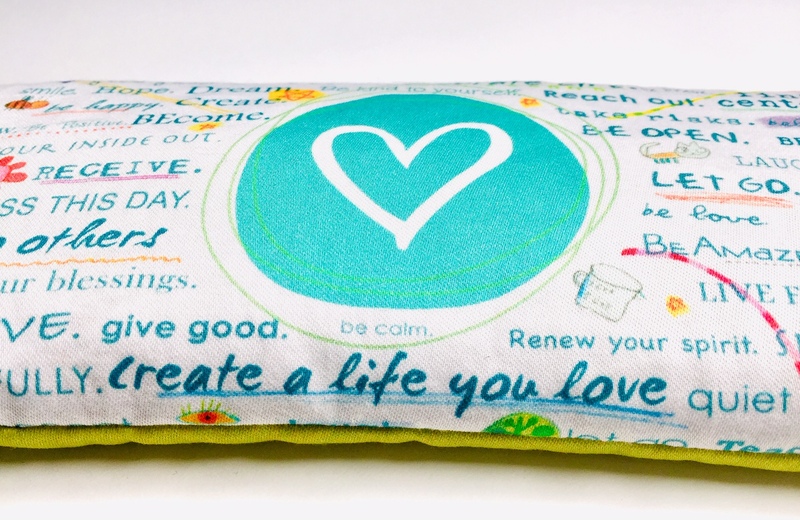 And for those of you participating in Hip Mountain Mama’s One Small Change efforts, check out her March giveaway. Here’s a hint: Inside Out E-Course! Your Personal Reflection: What do your closets and drawers look like? 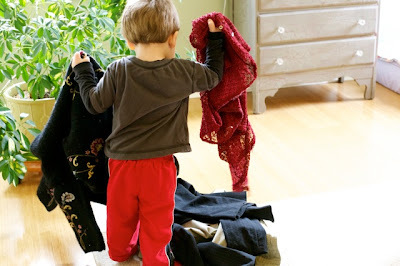 How can you reduce your clothing clutter? What small environmentally friendly changes can you make this month, as we get closer to Earth day? This is great! I can't wait to share my adventure of reducing my clothing clutter. For whatever reason, people love to give me their old clothes. This is great on one hand but on the other, enough is enough is enough!!! What an inspiration! THANK YOU! This is such a great push for me! With the move, I really need to de clutter! I have sold some of my favorite yarn (so sad, but there will always be more), and now my closets are next! There are so many clothes in my closet, but I wear the same things over and over….these clothes need to go to someone in need! I will make this my goal this week…maybe even today!! By the way, the necklace is gorgeous! You are very talented!!! I am so glad you are a part of our One Small Change!! My friend had a clothing swap this past weekend (on very short notice), and I quickly ripped through my closet Sat. a.m. in preparation…I left with one small garbage bag full, and came home with only four items (all for repurpose…she tends to invite a bunch of size 4 ladies…yikes!). The pile of clothes I pulled from my closet is still on the floor, looking like a very lot of clutter…I noticed several more things this morning I "should" have given away, but couldn't for one reason or another…I think I'll have to have a more organized clear-out session next weekend (along the line of yours) and really go through it all, getting a bag ready for next year's swap (or just drop it all at Goodwill). Thanks for the inspiration!! Fabulous post! And think, all of those items in the "donate" pile are making someone else happy! I've found that if I give my "maybe" pile a little time, I can usually pare it down too! My thought is if I don't need it, want it, love it, or use it…it's out-a-here! As Andrea said above a clothing exchange or swap is a great way to recycle clothes. Everyone brings clothing, shoes etc. that they are no longer interested in and it all goes into one pile. Everyone can bid on the clothes they want. Everyone tries on the clothes and whatever people don't want goes back in the middle. Then those clothes are available for whoever wants them. After that, the clothes left over get donated to a local women's shelter. This is a fantastic way to add "new" clothes to your wardrobe while getting rid of clothes that no longer fit or you don't like anymore. The women at the shelter benefit too. I'm also doing good! What a wonderful feeling! The whole family works with me!! Oh, geez, you're right. I cleaned out some old clothes a while ago and put some of them in the repurpose pile. Well, when I cleaned out my CRS I found them again. I hadn't used them in a year so they went straight to the donate bag. Tonight, this very night, I'm hitting my closet again with your deadline of 1 hour. That seems so manageable and won't leave me time to think about putting things back. You guys are sooo amazing. Seriously…don't you think it helps so much knowing we are doing this together. I don't feel like I'll get swallowed up in my clothes piles 'cause I feel like eventually you guys would find me! I'm looking out for you, too. Wow! Looks like you really made some progress there! I don't have too much to get rid of in the clothing department as I am not much of a shopper for clothes. Or shoes. Or purses. I work from home, so I basically wear jeans or sweats most of the time. And it really, really helps that I live in an older house that only has one teeny, tiny closet…ALL my clothes must fit in there….no where else to put them! I went through most of my clothes a few years ago when I did The Artist's Way and really weeded things out then. I really like your way of doing this! I'm in desperate need of a closet clean out, but I'm never sure of what I'll need. I'm a shopper, for sure, but I also feel like I wear most of what I own. There are a few things, like dresses, that I don't get the opportunity to wear much, but I feel like I need to keep. Do you have any more tips as to what to keep? Love your one small change! As I unpack from our move, I've been doing this very thing! Our move time line didn't allow for the decluttering that I had hoped for. So I've been decluttering as I unpack, and just finished with my clothes and my two younger boy's clothes as well. So far in the last two weeks, I've gotten kitchen items cleaned out, books, the boy's room, and clothes!! I'm on a roll, and it feels great! Slowly, but surely, my effort to reduce the clutter of clothes present in my life is moving forward. In the past 3 weeks, I've donated one large yard waste bag, one kitchen waste bag, and 3 grocery bags of clothes and shoes (and an iron) to GoodWill and a local church. My "upcycle" pile includes 3 sweaters. One is a great cotton cable from J. Crew from which I'm making my brother's girlfriend a set of leg warmers; the other two are wool sweaters I've accidentally shrunk (oof). These will become purses which I'll embellish and send off to friends!! My friend,S(megustaensalada), has really drawn me in to the idea of reducing all types of clutter in my life. Thanks for inspiring her, which has obviously inspired me!! I just got rid of about 95% of my clothing. I cannot believe how many things I was hanging on to. I had clothes from college, and all the sizes I have been in between including those awkward clothes you need around the childbearing years. I'm ashamed to admit that I donated 81, yes, 81 shirts. I also kept a small repurposing pile which I'm looking forward to delving into when I have some free time. that's HUGE! congrats to you. that is so amazing. i'll be interested to hear how you feel now going into your closet. I love your thoughts about repurposing; it's been a struggle for me not too just put most of the things we weed out in my studio. So important to keep the number of pending projects to a minimum! I did this last spring and what a lift…let so much stuff go.So nice to appreciate what I have(now that I can see it)The things that I didn't bring to the thriftstore I am now ripping up and making into crochet rugs and also quilts. 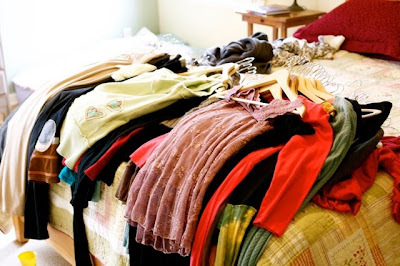 Small steps = victory: Last Monday I had two small-ish piles – one pile on hangers to go to consignment, the other pile in a box to go to Goodwill. I put them in my car before I could talk myself out of the idea. Friday, I stopped in at the consignment shop and they took 9 out of 11 items. Next stop was Goodwill where I unloaded everything. My problem is follow thru. Usually the clothes will be taken out of one closet and put into another, a holding closet, or "to be taken to consingment in appropriate season" – which never happens. This time, I let go of the seasons excuse. I found out that if I managed to get them into the car, ready to turn over, my job was 99% complete. So that is my new method: pack it up and get it into the car without giving myself time to think twice(aka time to talk myself out of letting it go). Yesterday I repeated that same exercise and came up with about the same amount – a little more than last week. I might be on the verge of skipping the consignment store stop! Thanks for all of your awesome comments. You guys are doing great stuff! Jennifer – I love your idea of just putting the things in the car. I usually have to take the items to the thrift store on the same day as well…otherwise they find their way to the basement and on my growing "to do" list.